"Dothan Airport" redirects here. For the former airport, see Dothan Municipal Airport. Dothan Regional Airport (IATA: DHN, ICAO: KDHN, FAA LID: DHN) is a public airport in Dale County, Alabama, seven miles northwest of Dothan, a city mostly in Houston County. The National Plan of Integrated Airport Systems for 2011–2015 called it a primary commercial service airport (more than 10,000 enplanements per year). Federal Aviation Administration records say the airport had 47,859 passenger boardings (enplanements) in calendar year 2008, 42,071 in 2009 and 41,453 in 2010. The only airline flights are on Delta Connection to Atlanta. Over 50% of Dothan's flights are military training operations from nearby Fort Rucker, NAS Whiting Field, and NAS Pensacola, while just under 40% are general aviation. In 1941 the United States Army Air Corps built Napier Field, named in honor of Major Edward L. Napier of Union Springs, Alabama. One of the Army's first flight surgeons, he was killed in the crash of a Fokker D.VII, AS-5382, at McCook Field, Dayton, Ohio, on 15 September 1923. He had been a Medical Corps Officer in World War I and had transferred to the Army Air Corps. He was receiving training as a flight surgeon at the time of his death. The official report states that he was piloting the plane himself and there was a structural failure of a wing. The 29th Flying Training Wing was activated at Napier on December 26, 1942. The 2116th (Pilot School, Advanced, Single-Engine) was main operational group at Napier Field. The group flew mostly AT-6 Texans as well as providing advanced & specialized training in single engine aircraft, including P-40 fighters. The first aircraft began operating on the field on October 1, 1941. On December 20, 1941, the first group of British cadets arrived for training under the Arnold Scheme. The first American cadets graduated on July 3, 1942 (42-F). In late May 1945, officers from the Mexican Army began P-40 training at Napier Field. The field was inactivated by the U.S. Army Air Forces on October 31, 1945, and the airfield and its improvements were made available to the City of Dothan and Houston County under an Agreement in 1946 which was jointly accepted. The airport lands lay dormant for about 20 years and Houston County later turned its share of Napier Field to the City. In 2004 the Air Force returned to the airport in the form of a non-flying unit, the 280th Combat Communications Squadron (280 CCS), an Air Force Special Operations Command (AFSOC)-gained unit of the Alabama Air National Guard, which established Dothan Regional Airport Air National Guard Station on the airport. Until 1965 the municipal airport was three miles west of town, where the Westgate Rec Center is now. It had three runways, all 4006 feet or less. Eastern Airlines stopped there from 1945 to 1964; Southern Airways arrived in 1956 and continued at the new airport. Dothan Regional Airport covers 1,150 acres (465 ha) at an elevation of 401 feet (122 m). It has two asphalt runways: 14/32 is 8,499 by 150 feet (2,590 x 46 m) and 18/36 is 5,498 by 100 feet (1,676 x 30 m). In 2011 the airport had 85,201 aircraft operations, an average of 233 per day: 55% military, 40% general aviation, 4% airline, and 1% air taxi. 91 aircraft were then based at this airport: 52% single-engine, 40% multi-engine, 8% jet, and 1% helicopter. In November 1985, a former US Air Force C-131H, AF Ser. No. 54-2817, which was in the process of being transferred from the Air Force to the US Navy's Fleet Air Logistics Squadron 48 (VR-48) at Andrews AFB/NAF Washington, Maryland, crashed on takeoff during a post-contract maintenance acceptance flight, killing the crew of 3 on board. Poor civilian contract maintenance on the elevator control cables was determined as the cause of the mishap. On August 31, 1991 a Boeing 707 operated by Lloyd Aereo Boliviano was damaged beyond repair in a hangar fire. ^ a b c d e FAA Airport Master Record for DHN (Form 5010 PDF). Federal Aviation Administration. Effective November 15, 2012. 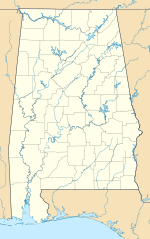 ^ a b "Dothan, AL: Dothan (DHN)". Bureau of Transportation Statistics (BTS), Research and Innovative Technology Administration (RITA), U.S. Department of Transportation. December 2016. Retrieved May 6, 2017. ^ "About Us". Dothan Reginal Airport. Retrieved 8 August 2016. ^ It is the 2nd Commercial primary airport. About Dothan Regional Airport Archived March 12, 2006, at Archive.today. Retrieved June 25, 2007. Wikimedia Commons has media related to Dothan Regional Airport.